Bestow Early Learning Center is a family-owned early care and education program in the heart of Alabama’s largest city, Birmingham. Mrs. Adrienne Loder and her husband founded Bestow, and the two have created a special space for mainly African-American children to learn and play. Through the National Early Care and Education Learning Collaborative (ECELC), Mrs. Loder began to make many changes in her program, including going for walks to visit a local urban farm, incorporating yoga daily, and implementing family style dining. 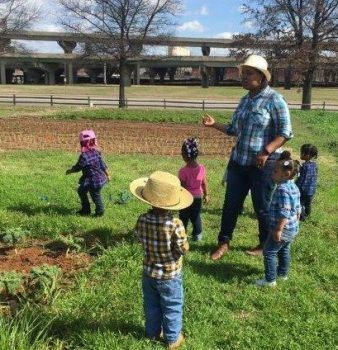 Farm Days — Bestow is located adjacent to one of the most popular urban farms in the inner city, allowing Mrs. Loder to connect with this community project and providing many opportunities for educational and enrichment experiences. Several classes have taken a walk across the road to visit this farm and to have class outdoors. The 2-year-olds have been studying fruits and veggies that grow up from the ground compared to ones that grow underground. Through this experience, they were able to see firsthand how these fruits and vegetables grow. Yoga — Bestow staff began practicing yoga (the children call it “yogurt”) as an enrichment and meditation exercise. The classroom teachers ran with the idea and began to incorporate this physical activity in their daily schedules. Each afternoon as the children wake up from nap, they lay their blankets on the floor and begin stretching into their yoga poses. The routines also include YouTube videos that provide soothing music for children. Mrs. Loder stated that the children excitedly scream for “yogurt” each day after nap, and now it is a regular part of their routine. Mrs. Loder is hoping to offer yoga as a family engagement activity and to someday hire a certified yoga teacher to support this physical activity in the classroom. Teachers also participate by laying their blankets on the floor, meditating and stretching next to their students, all while chuckling and enjoying some downward-dog time. Many of the teachers at Bestow have voiced their interest in becoming trained to teach yoga. Glendora Children’s Center in California started a weekly yoga program for all the teachers and their classrooms. The director wanted to introduce yoga in her program long before participating in ECELC, however, she did not have the resources. Find information from the National Farm to School Network on the basics of farm to preschool, getting started with farm to preschool, and information on local procurement for child care centers and home-based child care.